HEMPSTEAD, Long Island -- Millennials, people born after 1980, have already surpassed baby boomers as the largest living generation in the United States, and they are now essentially tied for 31 percent of the nation's electorate, according to Pew Research Center analysis of U.S. Census Bureau data. There is an estimated 69.2 million voter-age millennials in the U.S. and approximately 69.7 million baby boomers. Millennials will overtake boomers by 2020. The first presidential debate will be held on the campus of Hofstra University where there is excitement, enthusiasm and a plethora of opinions from millennial students, who can determine the outcome of the 2016 presidential election, like America's youth did in 2008 when 48.5 percent of young voters turned out in a year when the first black president, Sen. Barack Obama (D-IL), was elected over Sen. John McCain (R-AZ). "I hate Hillary Clinton," said Shannon Spada, a senior political science major at Hofstra, who is also a member of the Hofstra chapter of College Republicans. "She has blood on her hands from Benghazi, she's untrustworthy, she has 30 years of experience that doesn't prove she's been successful in anything." Fifty-five percent of Americans see Hillary Clinton unfavorably to Donald Trump's 55% unfavorable rating, according to the latest ABC News/Washington Post poll. "Both candidates aren't the best that we've chosen," said Hofstra student Solangie Diaz, who is voting for Mrs. Clinton despite "agreeing" with Mr. Trump and the GOP on some issues, namely conservatives' pro-life stance on abortion. "I was hoping we'd have a third party candidate, but it's not going to happen," added student Mirjavolon Kurbonov, a Gary Johnson supporter. Johnson, the Libertarian Party's nominee, slipped from 9 percent to 5 percent, among likely voters in the latest ABC News/Washington Post poll, conducted from September 19-22. Jill Stein of the Green Party is polling at 1 percent. While a dead heat between Clinton and Trump, percentages within the poll's margin of error, the Republican nominee is winning with enthusiasm. Fifty-five percent of Trump supporters are "very enthusiastic" about his candidacy to 46 percent of enthused Clinton supporters. "It's hard for me to trust (Clinton), but I rather her than Trump," remarked Chris Virsner, a junior at Hofstra. "I definitely think we need to secure the borders," Spada said. "One of the main things that drew me to (Trump) is that we need a wall and we need a way to prevent people from coming in at their will." 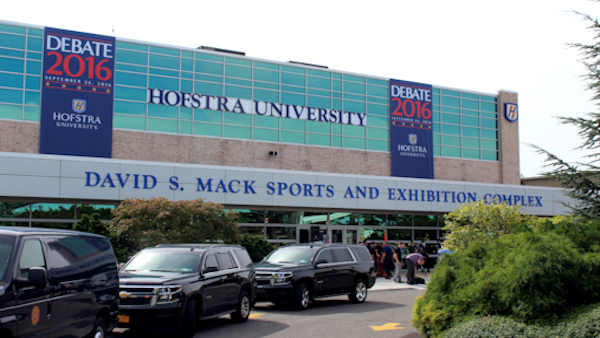 The first presidential debate at Hofstra University on Long Island begins at 6 PM, only on ABC7. Due to the presidential debate, tonight's "Jeopardy!" will be seen at 10 p.m. and "Wheel of Fortune" at 10:30 p.m. on ABC7.